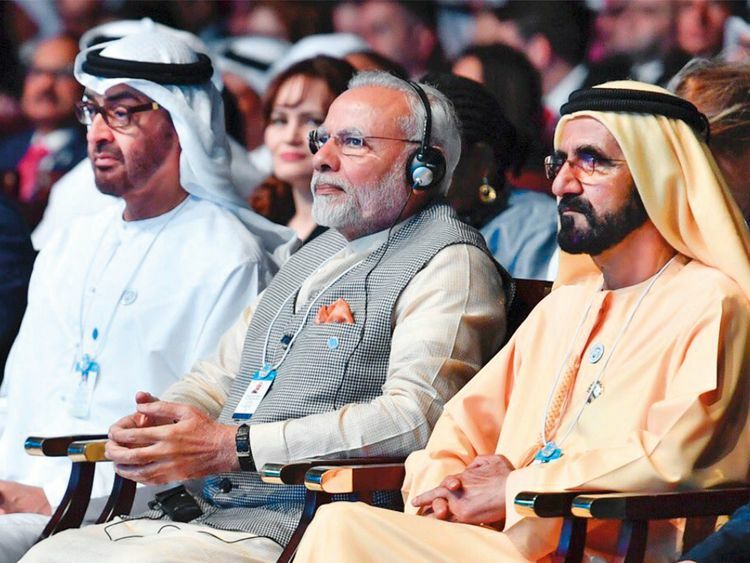 Relations between India and the UAE are going through a golden era. They are at their best ever. The bilateral relationship has matured and transformed into a comprehensive strategic partnership as both countries continue to explore deeper cooperation in new areas. The bilateral relationship has matured and transformed into a comprehensive strategic partnership as both countries continue to explore deeper cooperation in new areas. The deepening of energy ties was a highlight of last year. The relationship has transformed from a buyer-seller relationship to that of a strategic partnership in energy security, with Abu Dhabi National Oil Company (ADNOC) delivering the crude oil for storage in Mangalore Strategic reserve and a consortium of Indian oil companies acquiring a 10 per cent stake in the Lower Zakum Offshore oil field in Abu Dhabi. ADNOC and Saudi Aramco signed a framework agreement with Indian oil companies to set up a $44-billion (Dh161.6-billion) refinery in Maharashtra during the visit of Shaikh Abdullah Bin Zayed Al Nahyan, UAE Minister of Foreign Affairs and International Cooperation, to India in June 2018. Defence has also emerged as a strong area of cooperation between both the countries. Our first bilateral naval exercise was held in March and another Indian coast guard ship, Vikram, visited the UAE in December, carrying out joint exercises with the UAE coast guard. Mohammad Ahmad Al Bawardi, UAE Minister of State for Defence Affairs, visited India last year and met defence minister Nirmala Sitharaman, discussing the possibility of joint defence production and identifying new areas of cooperation. India and the UAE also signed an MoU for cooperation in the field of manpower during the visit of Prime Minister Narendra Modi and they are exploring the possibility of linking their respective e-platforms for the benefit and welfare of Indian workers coming to the UAE. Both countries are now working to explore cooperation in regional and global forums. India and the UAE also signed an MoU for cooperation in Africa last year during the visit of Sushma Swaraj, India’s External Affairs Minister. Our bilateral cooperation also grew stronger in traditional areas of trade, culture and people to people relations. To boost trade further India and UAE signed a currency swap agreement in December 2018. India was designated as the Guest of Honour country at Abu Dhabi Music & Art Festival last year, while the fourth International Day of Yoga celebrations saw enthusiastic participation from UAE residents. The embassy’s efforts to strengthen the dynamic bilateral relationship have also been recognised by the UAE government. We were delighted to receive a special award from Shaikh Abdullah for our outstanding contribution in strengthening relations with the UAE. Total trade between both the countries stood at $50 billion in 2017, with exports from India to the UAE amounting to $28 billion and India’s imports from the UAE totalling $22 billion. Energy sector ties have morphed into a strategic partnership in energy security, with both countries investing in each other’s energy sector. Both countries are also trying to move forward in nuclear energy cooperation by institutionalising cooperation with Emirates Nuclear Energy Corporation and Federal Authority for Nuclear Regulation. India and the UAE are also exploring the possibility of enhancing cooperation in renewable energy. India and UAE are discussing cooperation in the establishment of logistics hubs, cold storage, warehousing and more to operationalise the food corridor between the two countries. Agricultural exports from India and projects in food processing were discussed during the sixth High Level Task Force for Investments (HLTFI) meeting in Mumbai in October 2018. Relevant business groups from the UAE and Indian states including Punjab, Madhya Pradesh, Maharashtra and Gujarat are in discussion to cooperate in operationalising the food corridor as early as possible. The proposed food corridor will help in ensuring food security for the UAE, as it will get the best quality agricultural products at cheaper prices. It will create opportunities for joint research and development in the agriculture sector. The food corridor will also help in increasing the earnings of Indian farmers. It will also help generate approximately 200,000 jobs in India as per initial estimates while increasing Indian food exports to the UAE to $7 billion per year. The UAE is the tenth biggest investor in India for foreign direct investments, with investments of approximately $5.33 billion. The investments are concentrated mainly in five sectors: services sector (9.4 per cent), power (9 per cent), construction/real estate development (8.8 per cent), air transport, including air freight (7.4 per cent), and hotels and tourism (7.3 per cent). Apart from this data, we are also seeing major investments by the Abu Dhabi Investment Authority, DP World and others into India’s infrastructure, real estate, energy and other sectors. We are focusing on increasing cooperation in new areas such as space, artificial intelligence, defence, energy security, food security and railways, while working to deepen the cooperation in traditional areas. Another focus area shall be to work towards fulfilling the commitment to invest $75 billion in India. We plan to continue regular high-level interactions within various institutional mechanisms between both countries. We plan to hold the third Strategic Dialogue, which is chaired by ministers of state for foreign affairs of both countries. The next meeting of HLTFI will also be held in the UAE to discuss trade- and investment-related issues. The Indian community is the foundation of strong India-UAE ties, which is well recognised by leaders from both the countries. The embassy and consulate plan to focus on Indian blue-collar workers in the UAE as they constitute a large part of our diaspora and they need maximum help. We plan to continue and intensify actions against illegal agents based out of India, who dupe innocent workers and leave them in difficulty. We will also continue to work closely with leading members of the Indian business community. As 2019 has been designated as Year of Tolerance, we plan to involve the larger Indian community in showcasing values of peace, love and tolerance. We also plan to involve the community in celebrating International Day of Yoga and the 150th anniversary of Mahatma Gandhi’s birth across the UAE. In addition to this, we have chalked out a plan to make all consular services more accessible and user-friendly and will be implementing it in phases. I congratulate all Indians and friends of India on the occasion of our Republic Day. On this day in 1950, India embarked on the path of progress and development in accordance with the principles enshrined in the Constitution of India. I am happy that Indians are the largest expatriate population in the UAE and have contributed to virtually every sphere of life here. The relations between the people of India and the UAE are centuries old but I believe that in recent times we have never seen the kind of extraordinary momentum in our relationship as we have seen over the past four years since the visit of Prime Minister Narendra Modi to the UAE in 2015. The relations between the people of India and the UAE are centuries old but I believe that in recent times we have never seen the kind of extraordinary momentum in our relationship as we have seen over the past four years since the visit of Prime Minister Narendra Modi to the UAE in August 2015. Since then, there has been exchange of visits at the highest levels between the two countries every year, highlighting the importance that the leadership of both countries attach to this relationship. Last year, a proud moment for us was when Prime Minister Modi addressed the World Government Summit in Dubai and highlighted the tremendous development taking place in India. We also had exchange of visits at the foreign minister-level between both countries. Our cooperation has solidified and continues to grow in a multitude of sectors, including energy, investments, infrastructure, food processing, space, skill development and new technology areas. Last year, the consulate undertook some new initiatives for the welfare of Indian community, the two main being the start of an Open House on the last Friday of every month and organising meetings of Indian community volunteers also on that day. Both these initiatives have been highly successful. The consulate also facilitated Indians during the Amnesty that ended on December 31. During this period we issued about 4,800 emergency certificates free of cost and about 2,800 passports to Indians. We also provided assistance for subsistence, payment of fines and air tickets to a large number of people for availing of the amnesty. We also continued to work for the promotion of trade and investment relationship between India and UAE. We will continue to assist the business communities of both countries so that our trade and investment relations grow further. This year will also see quick progress on India’s pavilion for Expo 2020. Government of India is committed to participate in a big way in this marquee event of Dubai and will work to showcase all aspects of India as well as India-UAE relations through its pavilion.